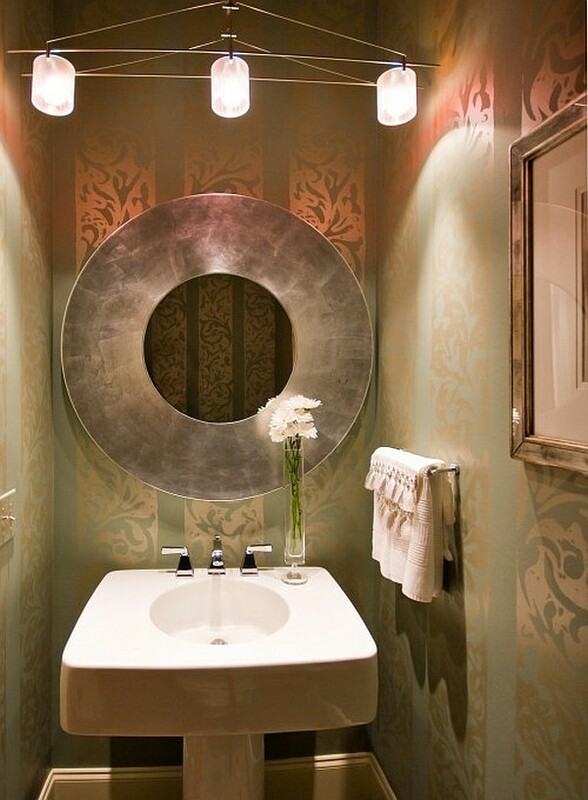 A powder room is usually a small room to decorate but that doesn’t mean it can’t have a lot of impact! There are so many cool ways to make a small room stand out. Whether you use texture, color, creative decor or a combination of all three, you can really give the space a nice wow factor. 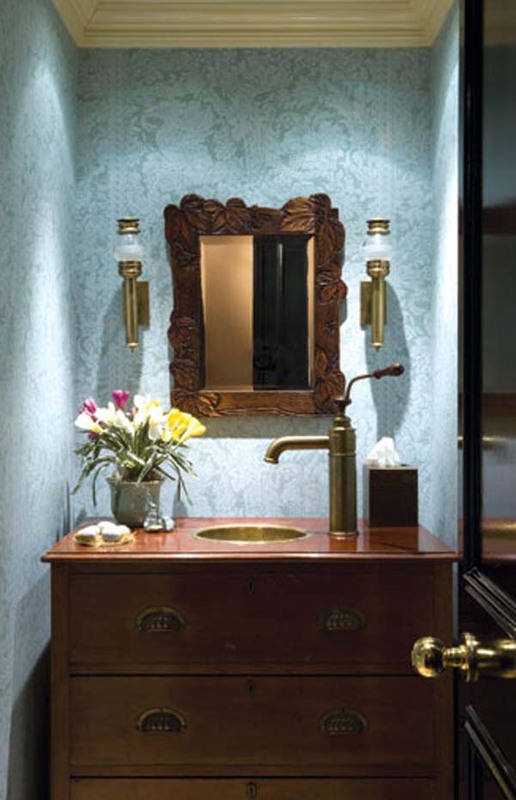 These powder room ideas all stand out with visual interest. I have a small and kind of an unusually shaped powder room that was a little bit of a challenge to work with. I decided that color would give me a nice pop and help out the room somewhat. Even though the room was small, I opted to still go with a dark navy blue to add some drama. The white trim and fixtures gave a nice contrast and brightened it up enough. I also love the idea of adding texture to create that wow factor. The stacked stone on the wall adds so much impact! And, the creative decorative elements you use in the fixtures such as mirrors and lighting can make all the difference in the world. 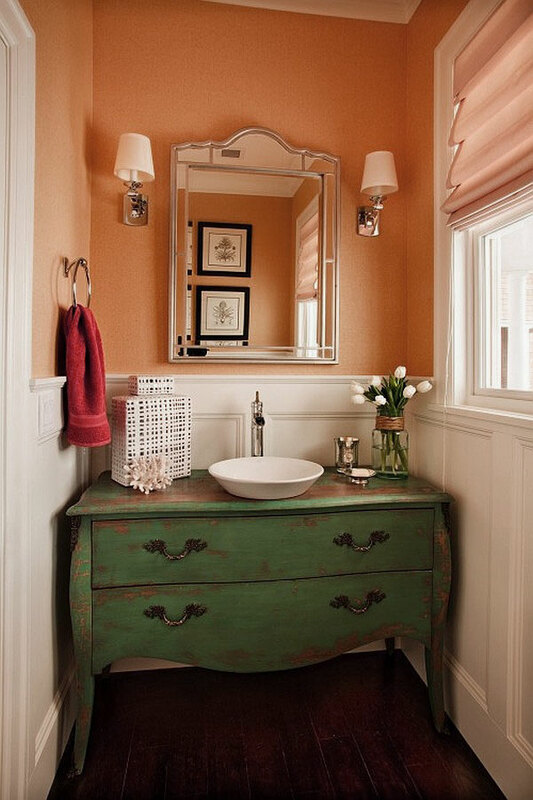 A vintage dresser makes a unique bathroom vanity that is full of warmth and interest. 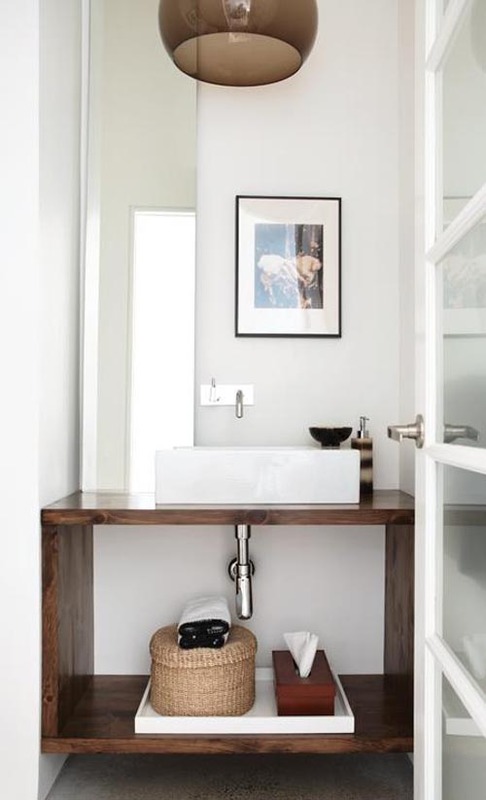 I did something similar to this with a vintage desk in one of our cabin bathrooms. Here is a sleek and chic idea for the minimalist! And, another dresser vanity…but with color. Now, this last one just has to be the most unique idea that I have ever seen. 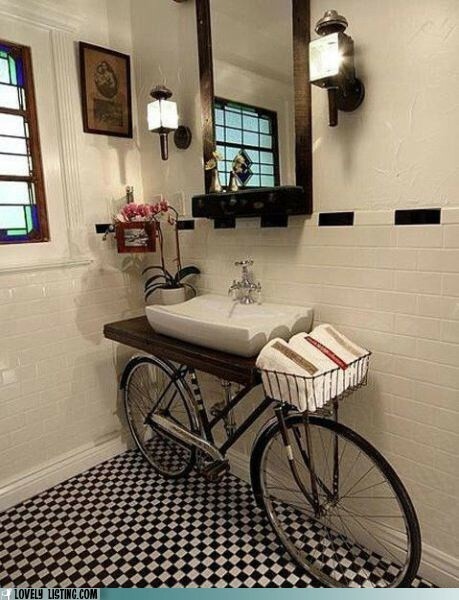 A bicycle vanity is totally unexpected and fun! The pipe for the sink is hidden so well in the frame of the bike. 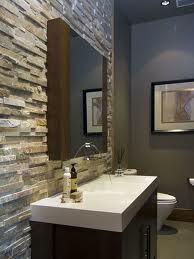 Do you have any powder room ideas that you would like to share? Just leave a comment below! 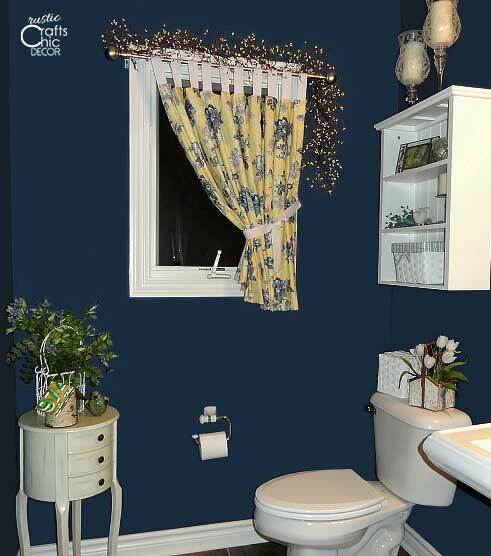 I really like your navy blue bathroom a lot. And I loved the bicycle sink! I am partial to bicycle things. When I was in high school I was a weaver, on and off loom. My off-loom was often combined with Macrame knots as well. I competed in a lot of student art shows and my first (of many for this piece) best of show award was for a weaving done on both sides of an old bicycle rim! I loved that thing! We were a poor family with 6 kids and I had to be very creative with my art, plus that’s what my instructor encouraged.I had a show coming up and was struggling for an idea and walked in the garage to get an ice cream out of the freezer and saw the rim and it clicked in my head I tied a string to the top ad safety pinned it to the back of a chair and got to work. I used my leftover brown yarns from other projects on one side and greens on the other. I eventually sold it to an artist neighbor of mine in my first apartment as a teen in Orlando. I sold other stuff to art teachers and had commissioned work in high school too. I made me more proud to sell something to someone in the business than just to a collector. To get the respect from someone else in your field of art means everything in the world to me!